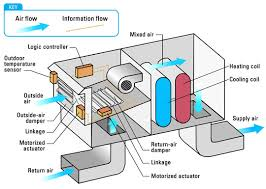 Have you ever wondered when, why and if to change your air filter(s) at home or in the office? Sometimes your thermostat tells you ... How does it know when? Sometimes you happen to think about it when you see those ugly blue filters in the grocery store. And then, you really think about it when the A/C stops working and the technician shows up and the culprit is ... You guessed it, Dirty Air Filters. 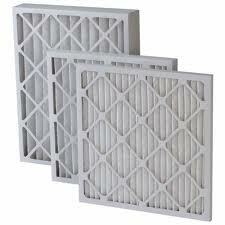 Air filters are designed to catch fairly large, it is all relative, particulate out of the air stream. Most filters are great at catching dust, per hair, etc... 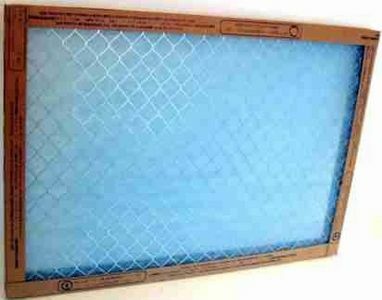 The "ugly blue" air filters are really great for catching pigeons, children and other items of that size, not so good at removing the proper sized particulate from the air stream though. To really help with dust control, pet dander, and pollen, we suggest using a pleated air filter, it has more surface area, due to the folded pleats designed into it and does a much better job than old blue. Air filters are designed into the total HVAC system for only one reason: It isn't to control the dust on the end-table ... The main purpose of these filters is to prevent the dust and debris from collecting on the face of the coil (heat exchanger) of the air conditioning portion of the system. The refrigerant (trade name Freon) in the system requires that heat be transferred from the air stream into the refrigerant circuit, it can only do this efficiently when the entire coil surface is clean and available for this exchange. The natural by-product of air conditioning (cooling) is dehumidification, hence when dehumidifying, the evaporator (indoor coil) is wet with condensation, this would really gum-up with dust and grime if the filter was not there to PROTECT the coil surface. That is the entire purpose for the filter, all of the other benefits we enjoy are just icing on the cake. As i said above, sometimes your thermostat will tell you to do it ... It is simply guessing. It uses a hypothesis to say to do it based upon hours of operation, not "dirtiness" or pressure drop or anything scientific. This is really a convenience feature that is there to simply serve as a reminder to do it. We suggest changing the air filters in your home and office environment quarterly, four times per year. Most residential systems only have one or a few filters, many office buildings have a much larger count and therefore will need to be considered in the budgeting process. Your HVAC service contractor can help with the value to add in for that replacement program. A furnace filter pulls a majority of unwanted particles from your indoor air. Such as household dust, smoke, pollen, dust mites and smog. Using a filter in your furnace is an easy way to reduce the cost of energy you use. Thanks for sharing the air filter replace guide. That would be appreciable. Changing air filter always helps in purifying the air. Thanks for sharing the article. This article really got my problem. Thanks for sharing that amazing article. You share very useful tips through your blog post.